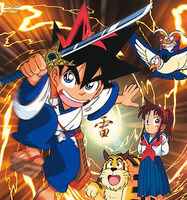 Plot Summary: Kurogane Yaiba is a boy who doesn't want to become what any regular kid would: He wants to be a samurai. That's why he undergoes a hard training with his father, knowing only the forest as his world. Then, one day, he is sent to Japan, where he has to deal with a whole new civilized reality, meeting the Mine family, the evil Onimaru and even the legendary Musashi, having lots of dangerous adventures, becoming stronger everyday.